Arrival in Buenos Aires. Transfer to the hotel and Check-In (after 14 pm). In the afternoon you are going to have a city tour to see the most important tourist attractions as the aristrocratic residential buildings at the north and their numerous restaurants, pastry shops, nightclubs and dressy stores, which create a fascinating atmosphere. You visit the dapper neighborhood called Palermo Chico in which embassies, consulates and museums are located. Furthermore you attend a park called “3rd February” or “The gardens of Palermos” in which are the following attractions located: “El Rosedal”, the botanical garden, the planetarium, the zoo, the Argentinean racecourse for horses as well as the monument “Monumento a La Carte Magna y las Cuatro Regiones Argentinas” and the urban golf course. The avenues are one of the world’s widest ones. On your finally trip to the observation deck of the congress palace and of the monument named “Monumento de los Dos Congresos” up to the “Plaza de Mayo” you pass the Obelisk, which is an emblem of Buenos Aires, the square of the republic, the Columbus theater and you have a short distance walk through the district called “San Telmo” up to the urban quarter “La Boca”. “La Boca” is very famous because of its interesting history. There is a street named “Caminito” which is famous for its spirit of tango music and its couloured buildings. In the evening Dinner Tango Show at “la Ventana”. It takes place in a historic tenement house that has been restored and is located in San Telmo district: the heart of Tango territory. It is the best Tango Dinner-Show if you want to enjoy an excellent cuisine and Argentine wines, in addition to providing an unforgettable tango and folklore show consisting of 32 artists on the stage: two orchestras, four pairs of dancers, two singers, altiplano music and “boleadoras” show. Breakfast in your hotel. Today free time to relax or for optional excursions. 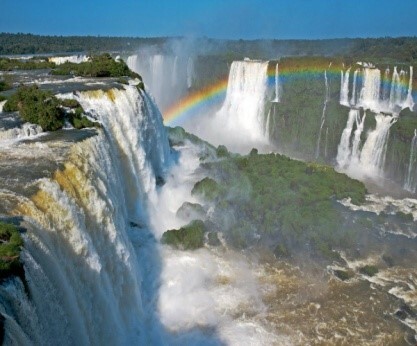 After breakfast, transfer to the airport to take your flight to Iguassu. Arrival, transfer to the hotel and check in (after 14 pm). Overnight stay. Breakfast in your Hotel. Today you visit the Argentinean countryside of the waterfalls. This excursion brings you to the waterfalls by using the hiking routes.Finally you arrive at a breathtaking canyon called “Granata del Diablo” (Canyon of the devil). A train through the jungle moves to the stations “waterfalls” and “Granata del Diablo”, even tought the hiking route named “Yvyra Retá” connects these two stations. By using some hiking routes it is possible to access the lookout point “Alvar-Nunes”, the waterfalls called “Bozetti”, “San Martin” and “the two sisters”. Breakfast in your hotel, then transfer to the hotel to take your flight to El Calafate. Breakfast in hotel. Today you visit Perito Moreno, a glacier located in the Los Glaciares National Park. It is one of the most important tourist attractions in the Argentinian Patagonia. The 250 km2 (97 sq mi) ice formation, and 30 km (19 mi) in length, is one of 48 glaciers fed by the Southern Patagoian Ice Field located in the Andes system shared with Chile. This ice field is the world's third largest reserve of freshwater. From a platform you can see the glacier from different points of view. You also have 3 free hours to explore the area on your own. Breakfast in your hotel, then transfer to the airport to take your flight back home.